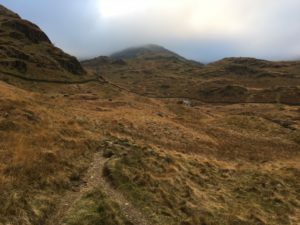 What better way to start off the new year and shake off that post-Christmas torpor than a few days walking in the Cumbrian National Park? The previous week’s snow held off, as did the rain. The barmaid in the pub I stayed in told me that the area had been unusually lacking in rain, however the moss covering absolutely everything was as thick, bright and moist as ever, and water seemed to be draining into every gully and dip in the landscape. It was cold with low sweeping clouds but once I got into the higher ground of the craggy glaciated valleys, where sheer rock faces protrude through the thining soil, towering above enormous scree slopes, I scarcely noticed. It is a beautiful an elemental place, carved out of an enormously complex variety of volcanic rocks, formed when the landmass of England and Wales collided with and joined that of Scotland. Walking these lonely paths I found lumps of ‘frothy’ lava, huge slabs of laminated tuffs made from layers of compacted volcanic ash and huge ragged seams of pure white quartz. 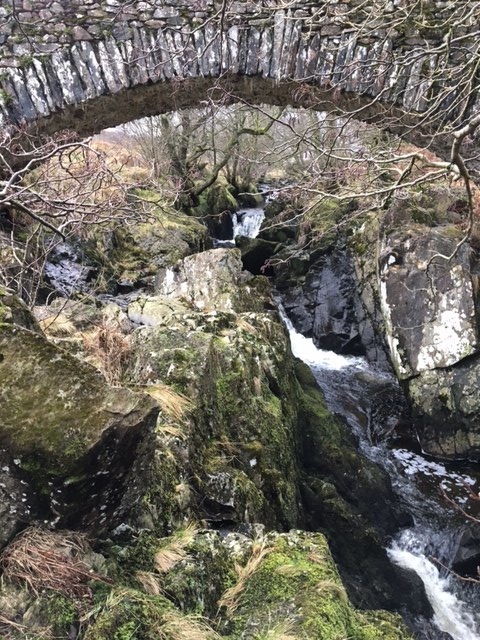 The brook and bridge in this image have become a tourist attraction after appearing in the ‘fishing with a shotgun’ scene in Withnail and I. The bridge itself is made from slabs of nearby limestone and is now hung with thousands of tiny white stalactites. As I wound down this smaller valley I was approaching the edge of the National Park. It is hard to get all the permissions necessary to collect rocks from Parks as they are, rightly, protected areas. I had already secured the permission needed to collect from the site that I was heading to, which had been pretty easy, but the main reason for my interest in this spot was its geological interest. I had previously collected a similar rock from a site on the other side of the Park, a place over 40 miles drive away. Here, making up a small peak on one side of the end of this valley, is apparently the same rock. The two outcrops being exposed peaks of an absolutely enormous underground batholith that stretches the whole way beneath the mountains and lakes of Cumbria. And here it is. 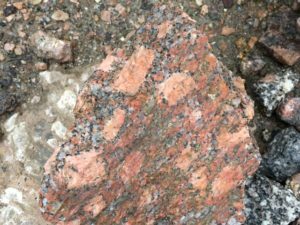 Pink granite. But it doesn’t look the same as the rocks I collected from the other exposure. 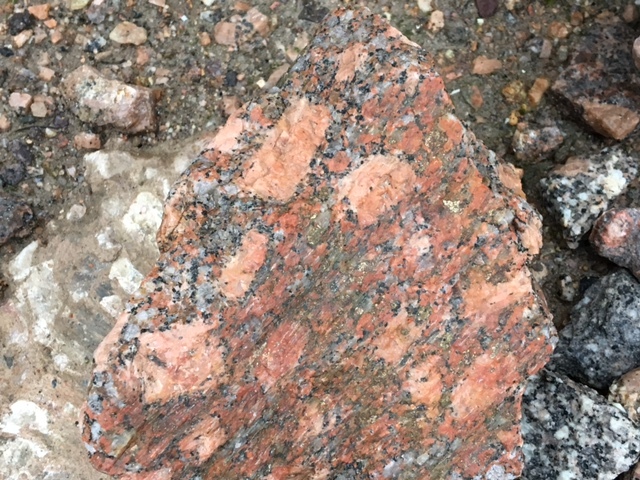 The pink feldspar crystals are much bigger and the crystalline ground mass surrounding them appears much darker with mica. One of the striking things about the other rock is the pale smoky blues and whites I can coax out of the other rock in my wood kiln, as it is so low in iron and manganese and other impurities commonly found in mica. But, as with books, I have learnt never to judge a rock by its colour/cover, and am very interested to see how this new version of geologically-the-same rock responds in my tests.